Although the weather isn’t looking the nicest over the next few days, it hasn’t stopped me from thinking about the changes I want to make to our outdoor space this spring and summer. As soon the temperatures start to rise and the sun shines a little longer in the day, I find any excuse I can to get outside. After completing our deck revamp a couple years ago, it created an outdoor room that we are able to use much more than we previously had been able to. Since then, I’ve been pondering what else I can do to make our back yard feel more livable. One thing that seems to keep grabbing my attention is the clever use of mirrors in an outdoor setting. One of my favorite looks for outdoor mirrors is placing them next to a dining area. I love how they reflect the beauty of the tablescape and give the illusion of the space being much larger than it actually is. Want to add ambiance in the evening? Mirrors can be used outside to effectively reflect candlelight from votives and lanterns. Add a mirror to the side of a building to replicate the look of a window. Combined with plant materials and chunky wood frames, they’re very good at fooling the eye. In small outdoor areas, mirrors can be hung to create the illusion of more space. The mirror behind this lattice on the gate makes it look as though the garden carries on. 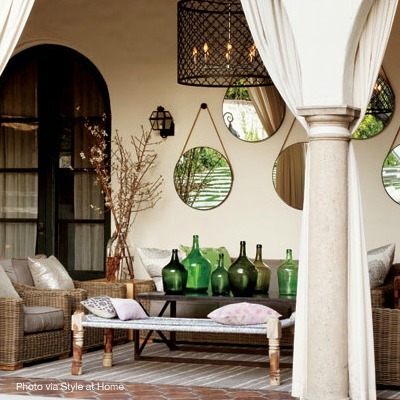 Grouping a collection of mirrors outside is a beautiful way to create interest. I love how the reflection of nature found in these round mirrors picks up on the rest of the green in this outdoor room. What will they reflect? Make sure it’s something you want to draw attention to. If there’s soil below, hang them a bit off the ground to prevent splash marks. If they’re in an unprotected area, only use types that are intended for exteriors (such as acrylic). Finish the frame in an exterior grade paint or stain. Secure them tightly to a sturdy surface. Have you started thinking about decorating your outdoor space yet? Ever considered using mirrors? I’m definitely going to find a way this season! « Get Ready to Join the Outdoor Extravaganza! I have honestly never thought of putting a mirror outside. Clearly I am behind the times. I really like that big leaning one. I think that one is my favorite. Such impact! 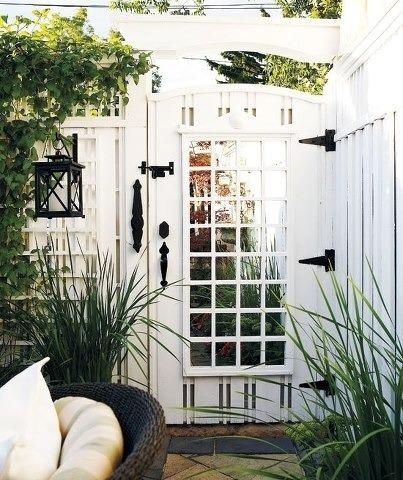 I too have been noticing them more and more in outdoor spaces and I love the look.. I love that first one especially. I’m not sure it would last long outdoors unless it was covered but that’s ok! You can get mirrors made for outside, and I think if you used exterior paint it would last a lot longer. Of course in our winters you’d want to store it indoors or cover it for sure! Oh, I just LOVE that idea of using a mirror outside! I am changing the garden off our patio area right now too so this is perfect timing, thanks Shauna!! I love the idea of putting mirrors outside. We’re crossing our fingers for a total backyard makeover very soon so I may have to do this, too. The mirrored gate is a lifesaver! I am replacing a fence and part of the process includes fencing off a very unsightly AC compressor. Doing so, however, means a 5′ “tunnel” from the gate to the point the side yard opens up. I think the mirror would be a lovely visual diversion. Question: can you show me more of the pergola above the gate? I’ve been searching and searching for outdoor mirrors to hang on a brick wall for a courtyard design I’m doing for a client and that’s how I found you. I can’t find them any where. Any suggestions? I thought of going to a mirror store and perhaps getting a frameless one. If I use a regular mirror, do I need to waterproof it? A regular mirror will age. Someone who specializes in mirrors may have an acrylic version that’s better for outdoor use if it’s going to be exposed. I’ve only hung them on covered porches with a frame painted in exterior grade. Perhaps a specialty garden centre will have something you’re looking for.